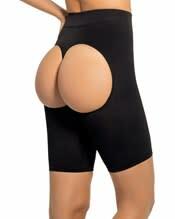 This shaper short boasts a natural booty shape! 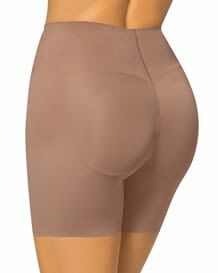 Targeted SkinFuse compression keeps tummy, hips, and thighs condensed while your rear is naturally shaped and enlarged with its open-rear design. Its wide waistband fits comfortably, stays in place and nicely defines your waistline. Garment care instructions: Hand wash cold, do not tumble dry, do not use bleach, use a soft detergent. If you need to machine wash this garment, we suggest using our Lingerie Laundry Bag (ref. D44175) to protect it from wear and tear. These body shapers are state-of-the-art garments made to redesign your figure in super soft and seamless material. Follow these steps to determine your invisible shapewear size. Questions? Please call our Customer Service Line 1-800-657-9107 for assistance.